Our first 36 hours on this great white continent have been a roller coaster of conditions and emotions. Immediately as we stepped out of the big Iluyshin we were struck by fairly brutal 16 knot winds and bad visibility. I’m sure the pilot would not have considered it were it not for his 200+ blue ice landings out here. We were collecting by an outlandish group of awesome vehicles, snow cats, snowmobile and jacked up six wheel buses that look exactly like those from Freya’s Lego polar set! Mark managed to pick off a few key shots but in the harsh conditions with no shelter other than the vehicles everybody was keen to hustle. They drove us to ALE’s astounding Union Glacier camp surrounded by the stunning Ellsworth Mountains. Fed by the blue ice runway and the large Iluyshin payload their operation that started out at a different site 100km north at Pariott Hills almost 30 years ago has grown into a world class example of a self-sustaining polar logistics hub capable of serving over 250 people to hotel standards with negligible environmental impact during the short 3 months of the Antarctic summer. 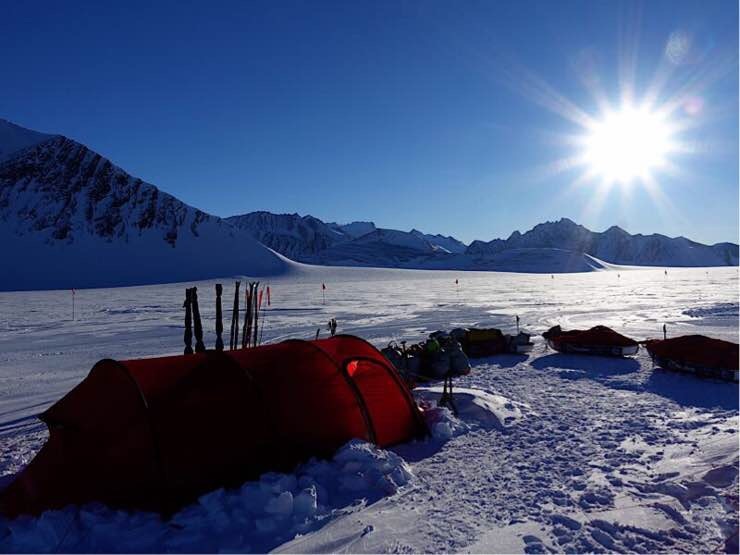 Union glacier camp is a well ordered community of tents and portable structure of all shapes and sizes. Several giant heated dinning tents serving restaurant quality food, converted shipping containers for operations, communications and medical centres, giant workshops maintaining the crazy fleet of ground and aircraft, dozens of luxurious guest tents and dozens more mountain tents for the 100 staff that pass through each short season. There are quite a few interesting expeditions passing through at this early stage and several already in the field. A team of six British female soldiers – the ice maidens, with ambitious plans to woman-haul all the way from the Ross to the Ronne Ice Shelf have sadly been delayed by 11 days due to bad weather on the Ross side. A fun bunch, I really feel for them as such a lengthy and unknown delay period really plays havoc with emotions and psyche. Although it’s looking positive for them to get out tomorrow. Yesterday evening the weather cleared miraculously to glorious sunshine and zero wind. The contrast to the early afternoon could not have been starker. From hellish to heavenly. We set up camp and began sorting our stuff in glorious, exciting conditions. Then in the night in an area renowned for being sheltered from the wind a gale gusting to 30 knots battered our casually pitched tents. We awoke this morning to awful freezing winds and hostile conditions. My emotions have been paralleling the conditions and the thought of our imminent adventure filled me with dread. That was but a hint of what could be in store and was sufficient to make me want stay in my sleeping bag, or even, run away home altogether! Our drop off scheduled for the day after tomorrow at 88’, 110 just 200km from the South Pole, elevation around 3000m with the latitudinal effect making that feel more like 4000m will be much colder than here. Winds like that will be brutal out there! We spent the day organising kit and going through procedural preparations with ALE throughout which the weather steadily improved through conditions that would’ve been perfect for kiting to the point that now as I write in the midnight sun it is as a perfect blue sky without a breath of wind. Sublime, magical, exciting and wonderful. If we get some of this weather in mountains, I will have found my god. The wind will be both our best friend and our worst enemy for the next 10 weeks. Without it we are doomed as there is no way we can move our 200kg loads over 2000km with time to climb. But the slightest breeze is spine chillingly cold and when it blows fiercely it is not at all pleasant outside! I think we must be very conservative with our approach to severe conditions, certainly to begin with. Patience and a steady pace may just allow us to still achieve our aims and enjoy the ride without too much punishment at the hands of the cruel and kind mistress of Antarctica weather. Though I dare say we may be in for at least a bit of a spanking!!! Hi , how are you all , it’s fantastic to be there on schedule ! I hope the weather gives you a ” window ” of perfect condition’s …….. Keeping my finger’s and toe’s crossed for your trek . Good Luck Guys .